When Mercedes-Benz unveiled its SLS AMG Coupe, we thought it couldn’t possibly get any cooler; it was the perfect blend of vintage design and modern engineering expertise molded into one stunningly beautiful and unbelievably powerful machine. Then Mercedes revealed the Roadster version and we were left eating crow. Now, the German luxury automaker has done it again with the 2013 Mercedes-Benz SLS AMG GT. 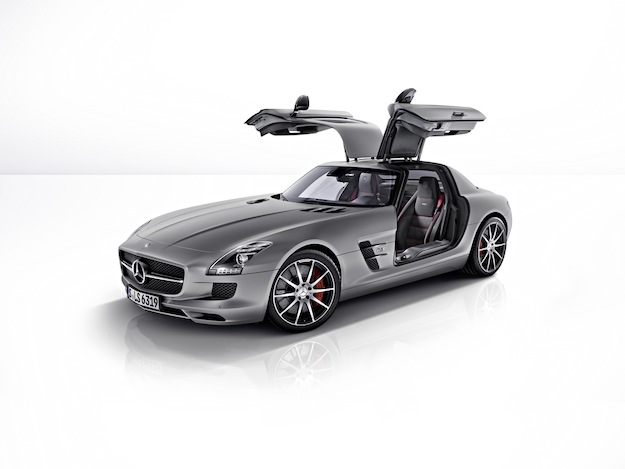 Available in both Coupe and Roadster variants, the GT replaces the standard SLS AMG in the US for the 2013 model year. Typically, when a company slaps a GT badge on the car, it means they’ve added some special fins to the bodywork and some red stitching on the interior. And that’s exactly what Mercedes has done with the SLS AMG GT. Only, the designers didn’t stop there. Capable of making a 0-60 run in 3.7 seconds and hitting an electronically limited top speed of 197 MPG, the SLS AMG GT 6.3-liter V8 has been re-tuned for greater performance. Already one of the world’s most powerfully naturally aspirated V8s in production, it now produces 583 horsepower and 479 pound-feet of torque. The 2013 Mercedes-Benz SLS AMG GT churns out 20 more horses than the standard SLS AMG. Improved, too, is the AMG SPEEDSHIFT DCT seven-speed sports transmission, which has been re-calibrated for better performance. Couple those engine and transmission tweaks with the modified AMG Adaptive Suspension and the GT quickly outshines its predecessor. Beyond the red GT badge on the back and its iconic gullwing doors, Mercedes has fitted the SLS AMG GT with darkened headlights and taillights, red brake calipers, distinctive 10-spoke wheels with a matte black inlay, and high gloss finish on the grille and on the side view mirrors. As mentioned above, the SLS AMG GT racing seats have been finished with Alcantara upholstery, accented with red stitching and red seatbelts. The 2013 SLS AMG GT is available in both Coupe (with the gullwings) and Roadster (cloth convertible) versions ,and while pricing hasn’t yet been announced, we presume it’ll be a tick higher than the $189,600 base price of the 2012 SLS AMG Coupe.